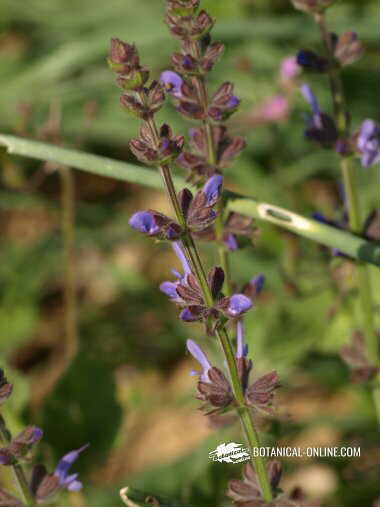 Foto de Salvia verbenaca L.
Herbaceous plant of the Mint family – Labiateae – up to 80 cm. tall. Glandular hairy stems. Basal leaves peciolate, oblong, lobed or irregularly toothed. Upper leaves smaller and unstalked. Flowers in verticils till 10, blue purple, till 1,5 cm long. Inflorescence shorter than in the other “Salvias“. Calyx bilabiate, with a similar length to the corolla, downy and sticky. By the woods, roads and dry grasslands.